Criminalizing a bit of Christmas fun has to make you wonder. 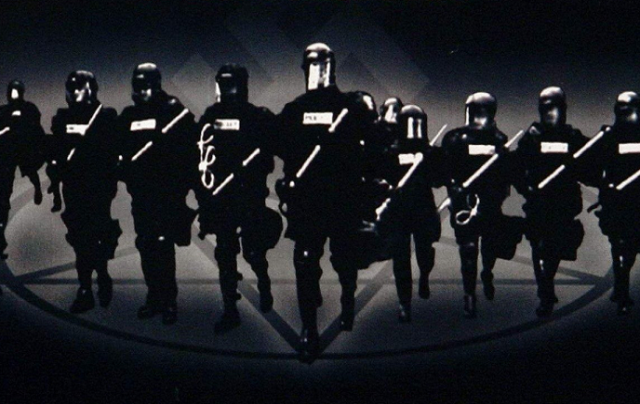 Is there any aspect of our life left into which the police state does not intrude? Parents are regulated as to how they discipline their children. Spankings that were the tool of choice in my day are now illegal. Spanking is considered child abuse and can result in state seizure of the child and prosecution of the parent. The state prescribes the terms on which children can be transported in cars. The cars themselves can only be designed within safety and fuel economy parameters determined by the state. The unsupervised children at play of my generation no longer exist outside of small towns. Not that long ago I reported on the arrest of a mother on the grounds that she permitted an underage kid to play unsupervised in the front yard of the home on a cul-de-sac. The arrest was made on the false report of a neighbor. The police seized the opportunity to arrest a mother on the basis of “failure to supervise an underage child.” The family was traumatized. The mother was put in jail, the child in Child Protective Custody, and the father rushed home from work to see if he could rescue his family from the intrusion of the American Police State. It has happened to many, and Americans sit there sucking their thumbs, hoping the lion will choose another antelope. The parents, grandparents, and aunts and uncles of my day would all have been locked up. My entire generation would have been raised in orphanages. When the state substitutes its judgment for that of parents, it takes the job away from them. Even within the same family children differ. Parents have to find the best approach for each child. Moreover, children who are always supervised never grow up. They learn neither responsibility nor street smarts. Children are even regulated how they can play. No pointing the finger and saying “bang, bang.” Even words are policed, some words no longer being permissible. Perhaps someone has studied the impact on culture of such intense state intrusion into private life. And there are other culture-changing factors. Consider Identity Politics. The other day I listened to a recording of Barbara Streisand singing “A Woman In Love” from 1980, and Celine Dion’s “The Power of Love” from years ago. Both of these performers are gifted with beautiful and powerful voices. I wondered if they have a counterpart today. Identity Politics is gradually delegitimizing heterosexual relationships, especially if the male is white, as Identity Politics defines the white heterosexual male as the oppressor of all other races and genders. Having heard that in “advanced circles” women are subjected to peer pressure not to have relationships with “white, sexist, racist males,” I was wondering if today Streisand would have to have a black lover in her video and whether Dion would have to pitch her song to a lesbian lover. People are born into what exists. They have no experience of what previously existed. Therefore, they do not know what has been lost. This generational effect is the best ally of the police state. People born into a country, in which unaccountable police can brutalize and murder and steal, born into a country, the government of which declares itself above both domestic and international law and the US Constitution, a country that ignores constitutional protections such as habeas corpus and due process of law, a country that based on a false claim that the country is indispensable and exceptional claims the right to destroy entire countries whose governments refuse to follow Washington’s orders, a country that claims the right to control explanations and that brands those who tell the truth to be conspiracy theorists, Russian agents, anti-semites, and enemies of the people, know no different. What to my generation is totalitarian horror is normal to them. That country is the United States of America. It is the most shameful country on earth. The United States is a country whose rulers regard their hegemony as more important than the wellbeing of people and the life of the planet. If the world is to survive America and if America is to survive as a country in which citizens are permitted free thought, free speech, to make their own decisions, to raise their own children and otherwise to be a free people, Americans will have to get angry at those who are destroying them and reply to the everyday violence that they experience in many different forms with violence of their own. There are two forces in history. One is ideas. The other is violence. Karl Marx said that ideas, although sometimes effective, such as his own, can become the control mechanism of the ruling class. In contrast, Marx said that violence is the effective force in history. In Marx’s analysis violence serves the working class, but this is no more than Marx’s assumption. Violence serves those who use it most forcefully. Today Washington’s violence has brought America up against Russia, China, Iran, and North Korea. Washington has outmatched itself. US President Trump, by seeking protection from Israel against his own government, has re-ignited Arab hostility to Israel and to the US. Today Israel is alone, defended only by Washington whose own stupidity has created powerful enemies. Washington has proved itself incapable of leadership. Russia, China, and Iran have proven that they are capable of leadership, and they are also making it clearer by the day that they are fed up with Washington. It is past time for Americans to get fed up with Washington, its lies and its abuse of power.